We were getting so many requests for a top-quality sealant that we brought in Miracle Sealants for stone, granite and ceramic tile. All tile jobs need to be sealed after installation. All surfaces benefit from a sealer and the grout is especially important to seal, being the most porous. We carry 3 main products. 511 Impregnator – This is for all surfaces and it creates a moisture and stain barrier. Use this to seal and reseal granite countertops. 511 Porous Plus – This product is formulated for all stone but is good for more porous stone such as limestone, travertine, or even on masonry. Use this on honed surfaces. 511 Seal Enhancer – If you have a stone that looks best darkened, this is the product that you need. For instance slate will maintain its darker and deeper tones with this sealer. Remember to reseal occasionly after the initial application for best protection. Also in stock is Stone Specific Granite Cleaner and Resealer for everyday use. It is non-acidic and will not weaken grout or harm the stone in any way. Great for countertops and showers. Works equally well for marble or any high-density polished stone. 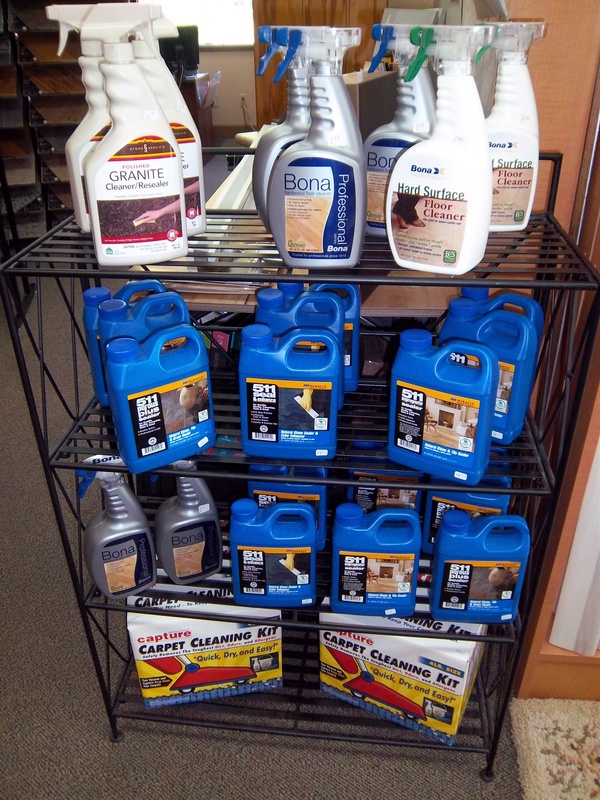 Bona is a great product for cleaning wood-flooring. It sprays on and easily wipes up with a swifter type mop. Also available is Bona for hard-surfaces which can be used for tile or laminate floors. Use this for light cleaning on any tile surface. Capture is a powdered carpet cleaner that is so easy to use to. Spot clean with the spray then lightly dust the powder into the soiled area. Wait 30 minutes or till dry and vacuum.